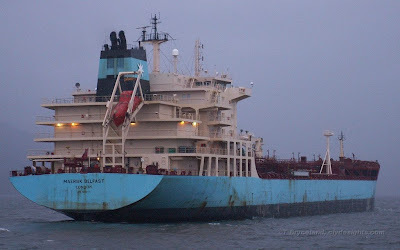 The tanker MAERSK BELFAST was seen on Thursday morning approaching Finnart to load a cargo of reformate for South Africa. MAERSK BELFAST, operated by Handytankers K/S, was built at Guangzhou Shipyard in China and delivered to Maersk in October 2005. She is 29,031 tonnes deadweight, and 175.21 metres overall. Her last port was Rouen, and before heading up Loch Long, she had lain at anchor at Brodick Bay for a couple of days.